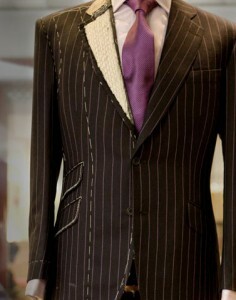 Of the many advantages of bespoke suiting, the most obvious is choice. You can have any kind of suit you like, with exactly the cut, style and cloth of your choice. Our master tailors can advise and help refine your vision until you have your own unique signature suit. Graham Browne have a wide selection of top quality cloth from around the world. We generally recommend cloth from British or Italian mills, such as those in Huddersfield, generally considered the world’s best or from the creative and technical masterpieces of Italy’s Caccioppoli. We offer only the traditional, full bespoke service. Following a consultation with your tailor, a paper pattern will be created which is unique to you. This is kept on file for any future suits and will be refined over time, as your body changes. The paper pattern is used to cut the cloth, with the skill of our cutters not only ensuring a perfect fit but also that any steps of checks line up. You can often see this work being carried out in the shop and the resulting bundles of cloth being prepared for your baste fitting. At this first, baste fitting your tailor will ask you to try on a roughly tacked together version of the suit. This will allow for adjustments, especially of the shoulders and back. The suit will be marked up with chalk and sent back to the coat and trouser makers for adjustment. Next comes the forward fitting. This is the stage for final adjustments, to ensure the best fit possible. At this point the suit will be fully assembled and lined, and most of the buttons will be attached. The suit is almost ready at the final fitting, with a few last adjustments and the last buttons you’re ready to head out the door with a magnificent bespoke suit.